Do you want to become a digital influencer? I am sure that you answered with a big YES, that is why you are here now reading my post. Now let me ask you the reason why? Maybe you want to be known in the furture as the next big social media influencer like Maine Mendoza, or maybe you need it in your profession or business. Whatever it is, being a digital influencer in your own field will not happen overnight. Last year was a breakthrough. I was given a chance to speak in front of fellow digital influencers and marketers about my journey in this field of social media. In this journey, I've realized that there are steps for you to become one. This is a not a formula, but these are the things that I realized as I walk through this path. 1. Be credible. People will follow you if they trust you. To be able to show that you are credible will also not happen in a snap. It take years of effort and patience to show the world that you are indeed credible. 2. Share. Share. and Share. Share your knowledge and expertise for free. 3. Build a network. Join Groups. I feel good about myself if I am surrounded with like-minded individuals. Learn from them. 4. Be yourself. Be real. Be a real person and not a robot. Social media is already digital and your follower need someone who can reach them, and that is you. 5. Find conferences and events. Put your skills to the next level by attending conferences and events. One event that I really look up to is the Digital Influencers Marketing Summit organized by Digital Filipino. Check out the event details below and learn from practitioners. The 2015 Digital Influencers Marketing Summit (#DIMSummit2015) will be held on October 10, 2015 at Best Western Plus Antel Hotel, Makati City. In this event, learn how practitioners are building their digital influence to strengthen their branding and identity, sustaining their business and projects, converting strangers to customers and brand ambassadors. 1. Market positioning and explore collaboration opportunities. 2. Roadmap to digital thought leadership. 3. Getting your money's worth in digital marketing efforts and results dreived through it. 4. Learn how to build a customer engagement blueprint that works. 5. Meet emerging influential faces in blogging and social media. Be the next emerging influential person in social media. 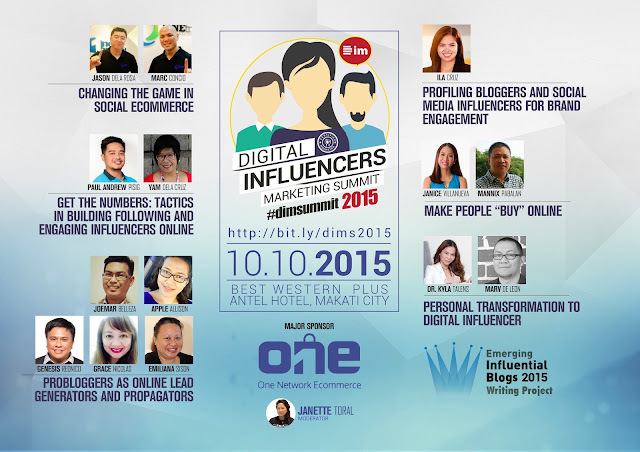 Attend the Digital Influencers Marketing Summit 2015 on October 10, 2015. Register now!